To make a caesar salad properly, you should be using fresh cooked bacon, homemade croutons, and a homemade Caesar salad dressing. You can get restaurant quality food and it won’t cost you any more than the “salad in a bag” approach. Check out the bottom of this page for complete instructions on how to prepare the perfect Caesar salad. This homemade caesar salad dressing recipe uses anchovies. If that makes you squeamish, feel free to leave them out. Fresh ground pepper. Like in one of those big pepper thingies. There is surprisingly little preparation in this dressing. You won’t even really be cooking it. First things first, you need to measure out your ingredients. Combine your garlic, anchovies, and egg in a food processor or a blender. Add the juice of half a lemon, two tablespoons of freshly shredded Parmesan, and two teaspoons of worcestershire sauce. Finally, add a quarter cup of olive oil and grind in as much pepper as you think you would enjoy. Chill in the refrigerator for at least fifteen minutes before serving. 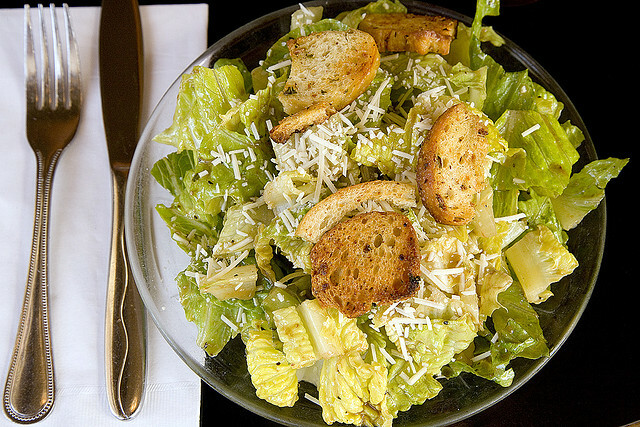 Combine with homemade croutons and perfectly cooked bacon when making your caesar salad. Don’t make more than you need. Even after coddling, the egg is practically raw. Use all of the dressing when you make it. Don’t try to store it for extended periods of time. A lot of folks don’t bother with homemade hamburgers. Since we’re already so used to fast food garbage, the frozen overpriced boxed burgers don’t really seem so bad. But that’s because most people can’t even remember the last time they had a good fresh hamburger. That can be remedied with this easy recipe for hamburgers. This recipe, as with any hamburger recipe, is best when you have access to a barbecue or a grill, but for simplicity’s sake, it will be assumed you’re cooking on a frying pan in a regular kitchen. You will need a pound and a half of ground beef. 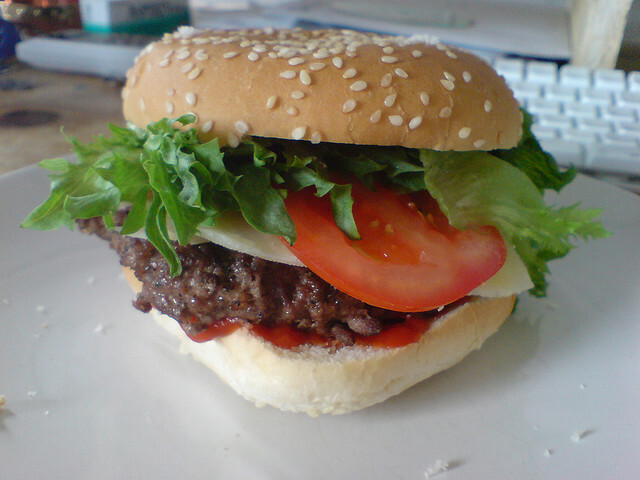 You can use a bit less meat if you’re willing to pad out your burgers with bread crumbs. You shouldn’t do that. You’ll also need some fresh garlic, rosemary, thyme, sage, and parsley. A bit of worcestershire sauce is recommended, and as with just about everything else, a bit of salt and pepper. Put your pound and a half of ground beef into a bowl and mix in two finely chopped garlic cloves, and a few shakes of rosemary, thyme, parsley, and sage, each. Add two tablespoons of worcestershire sauce, as well as a teaspoon of salt. As far as pepper goes, it’s ideal to use freshly ground pepper, but if you don’t have any, it’s okay to use the regular stuff. Mix everything together. Since it’s going to be easiest to use your hands, moisten your hands in cold water to help prevent the meat from sticking to you. Now divide the mixture into five equal balls. Roll them up and then flatten them into a patty. Assuming you’re cooking the burgers on a frying pan, use medium to high heat and cook each side until browned. Generally you’re looking at five to seven minutes on each side. This recipe for homemade hamburger patties makes about five patties. If you’re cooking for a lot of people, just double or triple the recipe. You can use any mixture of spices you’d like. Experiment to come up with a recipe for burgers that you love. Pair up with either baked fries or fried french fries. If you bother making a real hamburger you better actually make real fries too.